This day is soooooo snowy! Thankfully, we spent all yesterday outside doing leaves (again), putting up Christmas lights and creating some fun holiday pots for our front steps. So check that stuff off our list. Since I don't feel like driving in the snow to the gym, I did this workout this morning and it was quick and sweaty and perfect for getting rid of some Turkey Day bloat. I did the list 5 times through with no breaks and it took me 22 minutes and 31 seconds. It wasn't easy, but it was simple and went fairly quick. My family joined me in doing it and the kids were super "helpful," riding our backs while we did push ups and going through our plank "tunnels." Quality family time in the works! So normally, I only cook/bake the easiest, most lazy recipes, but this one is worth a little tiny bit of extra work. These are my three step perfect Brussels sprouts for any occasion...and what I'm bringing to both our Thanksgiving meals tomorrow. Not only are these delicious by themselves, but you can dress then up anyway you want. Bacon/maple, cherries/almonds, bacon/cranberries are some of my favorites. Slice your washed and trimmed sprouts in half. Drain sprouts again if there is any liquid in the pan. Roast those puppies for 20-30 minutes until they are brown and crispy. You'll have to toss them at least once during the roasting process. Note: if you are dressing them up with extras, I like to throw the "extras" onto the pan while roasting about 5-10 minutes before they are finished. This is such a quick and simple workout...but it will burn a bit and get your heart rate up in less than 15 minutes. Enjoy! I saved this sticky note from my first class of the day to share because it was soooo good! And by good, I mean sweaty and a great workout in about 20-25 minutes depending on rest. So here’s the deal: do each of the 6 exercises listed 10 times, the. 9 times, then 8...all the way to 1. Then go back up until you get to 10. Wew! I know, right!? Yesterday, it was cold. It was rainy. And my fridge? It was empty. I really really didn't want to the store to pick up dinner stuff, so I opened my freezer and realized I had a ton of half bags of frozen veggies, a pound of ground beef and in my cupboard, a can of tomatoes, an onion, some beef broth and a baking potato. All of that gave me a wonderful idea. I threw everything into my crockpot (after browning the meat and cutting up the onion and potato) and spiced it up In 5 hours (on low...you could speed up the process by cooking it on the stove in a stockpot for an hour or so) it was DELICIOUS. Here's what I had for the exact recipe, but I urge you to make your own out of your random stuff! Are you ready to gain some more energy, not feel starving all the time, plus, detox your body before the Holidays start? This 21-Day challenge does it all. And don't worry, you eat food (and lots of it) every single day; don't let the word "FAST" freak you out. During the challenge, we will eat during specific hours of the day...which can be flexible to fit all schedules. Most importantly, NO supplements-just real food and an easy to follow schedule, PLUS, you don't have to come to any special classes or appointments, it's all online via private Facebook page just for our little group. Don't wait until after the Holidays to get your wellness groove on. Get ready for the parties and treats and feasts by training your body to burn fat fast-this is something you can take into the Holidays to maintain or even get closer to your goals! Simply e-mail erin@ehfitness.com to sign up or ask questions! It doesn’t get much simpler than this. Do each exercise for 1minute...then repeat it 3 times. Enjoy! Remove pan from burner and let cool for a minute stirring continuously. Make into tablespoon sized balls (or use a cookie dough scoop if you're lazy...er resourceful... like me). Refrigerate for around an hour and eat 'em! Always the lazy cook, I've come up with the easiest and cleanest and tastiest Butternut Squash Soup that is perfect for the fall, winter or even cold in the summer. Plus, butternut squash is super high in vitamin A (you’ll get over 100% of your daily recommended intake). Vitamin A is required for the development of eyes, skin, and immune system. So it’s important. AND it has the super spice turmeric which is believed to aid in digestion, prevent Alzheimer’s disease, heal wounds, ward off cancer, control diabetes, relieve arthritis and a bunch of other awesome things. Makes you kind of want to just eat a whole canister of it, right? Don’t, that would be gross. But DO eat this soup! 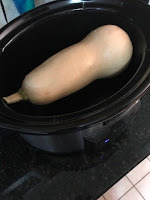 To make this the easiest thing ever, I recommend cooking your butternut squash in a crockpot. I often will just do this move and then keep the perfectly done squash in my fridge if I'm not read y to make the soup-yay! Check out this recipe in all of it's glory. Cook the butternut squash (whole) in a crockpot for 3-4 hours on low, let cool a bit and then scoop out the insides (toss the seeds). You can totally do this part a couple days in advance and keep the perfectly cooked squash in the fridge. Saute the onions in a bit of the chicken broth until they are soft (about 10 minutes), add all the spices and rest of the broth. Set aside and let cool a bit. Blend until smooth, add the coconut milk, blend again and you are done! High Intensity Interval Training, or HIIT, has been all over the news, in magazines and praised by trainers everywhere as a way to increase muscle, burn fat and save time even more so than regular, moderate exercise. Sounds good to me! And pair that with some awesome ab movements, you've got yourself a 30 minute workout that will keep burning fat for up to 9 hours as well as tone and train your core. Here's the deal: do each exercise for 35 seconds with a 5 second transition between moves. Repeat list for a total of 4 rounds and ta-da, you're finished in less than 30 minutes! Carb cycling or just trying to eat cleaner and at home more? 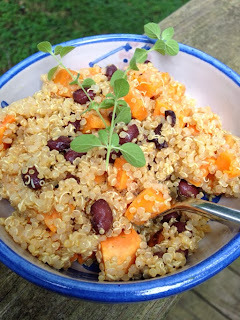 I've got you covered with the following list of super clean, super simple meals. Most of them are easy to make ahead or to double, triple or quadruple to freeze for easy and quick access to good REAL food. This meal is just perfection in my book. It's a way lower carb, way higher veggie version of fried rice with tons of yummy protein and it's so fast and so yummy.I just get this amazing cauliflower fried rice at Trader Joe's, some extra cauliflower rice, broccoli, chicken an egg and coconut aminos (tastes like soy sauce but with health benefits). The chicken is the "hardest" part....but not if you use leftovers from grilling or baking, or, in a pinch, a rotisserie chicken from sprouts (super clean) does the trick. I feel like I hear all the time that eating healthy is just too expensive, that people can't find good produce and that things just need to be more convenient to eat healthy most of the time. 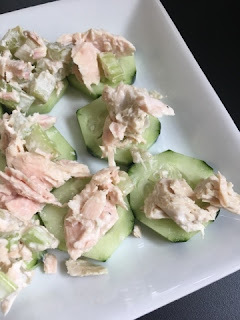 Well, I'm here to tell you that it doesn't have to be costly to eat right, that there is good produce to be found in the right places and that there are more options now than ever for healthy convenience food. I go to three stores every week and then Costco every other week. I know that it sounds like a lot, but I know exactly what I'm going to get at each store for the most part. I also know which stores have the best produce and what meats to buys where and the best of the best healthy food that is quick! It's taken me a while, but I have it down to a science for my family and I and if I can save someone time and $$, then yay!! Aldi: If you haven't tried it...you are truly missing out. Frozen "Hodge Podge" veggie mix...good with anything! Fall Wellness Challenge is here! 21 days of clean eating carb-cycling style. Get excited! It's super simple and totally tasty. Plus, I'll be doing it right along with you. Sample meal plans as well as suggestions for when you eat out . 21 days of accountability and encouragement and access to a ACE Certified personal trainer and wellness coach. 21 days of a small community of people doing the exact same thing you are, who have the same questions and struggles and we will work through it all together! Most importantly, NO supplements-just real food for real people living real lives. There's noting to lose, except maybe some inches and a few pounds. There's a lot to gain: body confidence, strength, good digestion, energy and a different way to eating. Today, my husband and kids suggested going to an amazing vegan bakery for a little snack...my favorite because they also bake the most delicious gluten free treats too! Much to my disappointment, they had sold all of the gluten free offerings that day...so sad. So when I got home, I decided to make my own treat with some bananas that were totally overripe and a huge zucchini from my in-laws garden. This is soooo easy, soooo yummy and full of fruit and veggies! 2 cups oats, pulsed in blender until "flour"
Clean and simple egg casserole that is anything but just for breakfast! This lasts for about a week in the fridge...enjoy! Cinco de Mayo...clean and tasty! Tomorrow is Cinco de Mayo and we are having people over to celebrate my husbands 40th birthday with a taco bar and such..yay! But that doesn't mean that I can't eat clean. Here is what I plan to do to stay on track and keep feeling amazing. shredded taco chicken (so easy, throw chicken breasts in the crockpot with a jar of salsa...all day on low, 4 hours on high), or pork shoulder or ground turkey (we are having it all :) ). I use this super simple home-made taco seasoning. Taco seasoning is kinda tricky when buying it at the store...there are some additives and sugar in most of them. So just make your own! This is my go-to recipe that I double or triple to last a while. 21 days of clean eating. Get excited! It's super simple and totally tasty. Plus, I'll be doing it right along with you. Sample meal plans as well as suggestions for when you eat out. There's noting to lose, except maybe some inches and a few pounds. There's a lot to gain: body confidence, strength, good digestion, better sleep, energy and a different way to eating. If you're interested, simply e-mail me here (erin@ehfitness.com) and let me know to put you on the list or feel free to ask any questions! When you sign up, I will add you to our closed Facebook group where the food lists will be so you can be prepared for day one: Monday, April 23. I have always felt that salads that other people make, whether it's restaurants or friends/family, always taste better. I hate the prep and I can never get the salad dressing right. Until now. You guys, this salad has EVERYTHING in it: tons of veggies, protein, fiber, good fats and overall deliciousness. My husband raved about it and so I've been making it a lot. And now, I have it prepped and ready to go at any moment. This salad is a meal all by itself and I've been eating it three or four days a week..it's that good and totally versatile. I'm also in love with the dressing I use-it takes like 30 seconds to make. Two ingredient chocolate cake brownies....yep...that's right! I also like to add a sprinkle of sea salt to my cake brownies before I bake them, but then that would be 3 ingredients....so if that feels like too much, skip it. These are great served with berries or just by themselves. Refrigerate leftovers. Check out the nutrition facts for one GIANT brownie (1/9 of the pan)!